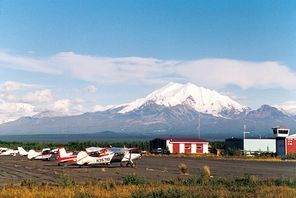 The Wrangell Mountains Dominate The Eastern Half Of The Copper Valley. The Copper Valley is surrounded by four major mountain chains. Each of them is a sizable mass of rock, glaciers and snow, stretching for miles. To the south, is the Chugach Range, which is 250 miles long and 60 miles wide, and arcs along the coast, blocking the Copper Valley from Anchorage, Valdez, and the Matanuska Valley. The Chugach Mountains are breached by mountain passes. One of these passes is on the Glenn Highway. It's called Eureka Summit. The other Chugach Mountain Pass you may travel over is Thompson Pass, on the Richardson HIghway, north of Valdez. The Talkeetna Mountains border the Copper Valley to the west, separating it from what is now the Parks Highway, and Talkeetna. They are smaller than the Chugach Mountains. As you drive the Glenn Highway to the Copper Valley, they are to the north, and the Chugach Mountains are to the south. The Alaska Range is farther north. This range arcs above the Copper River Valley. It runs above the Denali Highway, and sweeps down to Denali National Park. The Denali Highway is a gravel road that starts at Paxson on the Richardson and travels 135 miles cross-wilderness to Cantwell, on the Parks. Finally, the Wrangell Mountains are the defining mountains of the Copper River Region. These mountains are huge volcanic mountains. Mt. Wrangell is a massive "shield" volcano, and it's still active. It's one of the largest shield volcanoes in the world. Mount Blackburn is the tallest mountain you can see from the road system. It's 16,390 feet tall. Mt. Sanford is 16,237 feet tall. Mt. Wrangell is 14,163 feet tall. And Mt. Drum (which is the most dramatic when you're in Glennallen itself) is 12,010 feet tall. When you're in the Copper River Valley, and you're on high ground, you can usually see one or more sections of each of these mountain chains. 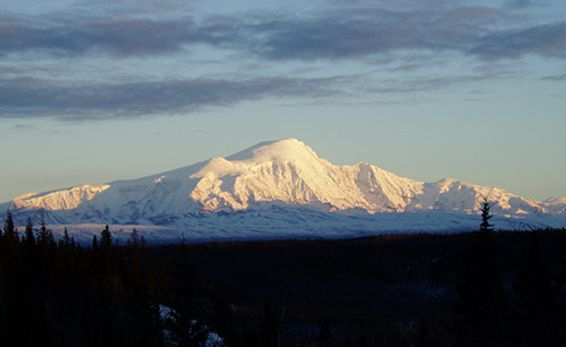 The Ahtna people call three of the four most visible Wrangell Mountains "K'elt'aeni." The Copper River is 300 miles long. It's a fast, muddy river, moving along at around 7 miles an hour, and dropping a significant 12 feet every mile. 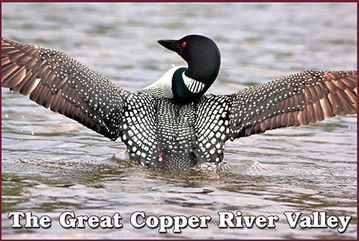 It is fed by 13 major tributaries, including the Klutina, the Gakona and the Gulkana Rivers. This Copper River curls around the Wrangell Mountains. 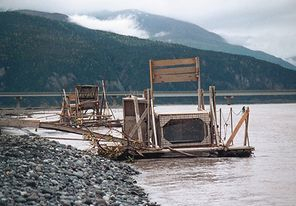 In the Copper Valley, its only bridge is the "Million Dollar Bridge" past Chitina. The Copper River has always been a major lifeline for local people, bringing high-quality, Copper River salmon in from the sea every summer. At one time, the entire Copper Valley was a large inland lake, blocked by ice dams. Around 10,000 years ago, the ice abruptly melted, and the lake emptied. 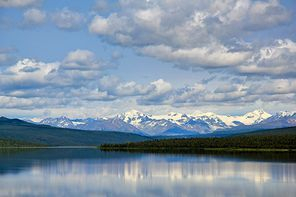 Today, most of the larger lakes in the Copper River region are located at the terminus of various huge glaciers: Tonsina Lake, Klutina Lake, Tazlina Lake. 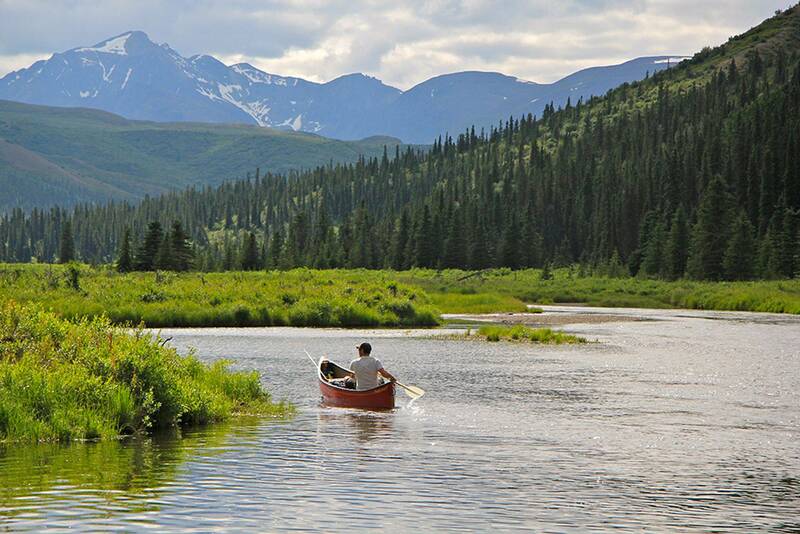 Lake Louise and Tolsona Lake are both off the Glenn Highway, and are used as recreational lakes. So are Paxson and Tangle Lakes, near the Denali Highway. Warning: Swimming in lakes and rivers, even in the summer, is not something that is particularly safe in Alaska. The shock of the ice cold water causes you to gasp in water reflexively. Always prepare for the worst if you are anywhere near water. It's best to go out with experienced people. Always use life vests.